How much does this fish weigh? How much do you think this fish weighs? This was my first fish of the season and being a northern fish this is a pretty decent size fish. It measured out a little over 21" but I didn't have a scale with me. My honest opinion, somewhere around 5lbs. Thanks! That is kind off what I was thinking but I wanted to see what you guy thought. This fish was well over 20" but SKINNY!!! It was about 4lbs...cold Northern waters!!! Conversely, I caught a 21 incher that only weighed 3lb9oz. I dont think LimpingLogan has that problem though. Id say 5.4579lbs. Go to this site and download the conversion chart. Of course nothing beats an accurate scale. I think I'll haveme1 ! That's a big ole belly on her !! I agree, 21" equates to about 5lbs. You don't know without a scale and it impossible to tell by pictures. I would guess just a hair over 4lbs. Nice fish. Agree with others that 21 is about 5-1/2 for LM in good body condition. And that's a big northern bass. Now...if you "cheated" and ran your tape from the tips of it's folded tail to the end of it's pulled out lower jaw -I'd say that "21" is 20.25" at best and may be just hitting 5lbs. That is still a big northern bass btw. If you do use a scale, make darn sure it's calibrated, and check it regularly. This is something of a pet peeve of mine, as too often fish weights are overestimated and really skew people's expectations of what a "big bass" should weigh. Length X Length X Girth / 1200 = weight in lbs. Length as Catt illustrated is mouth closed to end of tail, girth is around the widest area, dorsal fine down. You need the girth measurement to be accurate. A northern strain largemouth bass averages about 80% girth to length for a healthy bass. 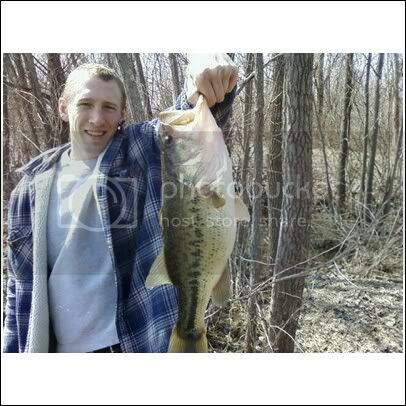 80% of 21" = 17" (16.8) and that would be a 6.25 lb bass and that looks about right judging from the photo. I like the graphics. : Makes perfect sense if you need to reach for the legal limit. I especially like the mackeral graphic, where you have to distort the fish to eek the most out of it. I believe the AFS standard for total length is with mouth closed and tail open, and their weight charts, and mine, are derived from this. In the end, get a GOOD scale, and KEEP it CALIBRATED. If you REALLY want to know what your fish weighed. Many prefer a subjective weight. I have always used forked length, an measure the girth as described. The tails on big bass can be warn and forked length doesn't vary much. I might also point out to flip a fish when measuring as well. Just about a week ago I was at a Club fish off holding down the measuring board and I kid you not one fish was almost a inch longer on one side compared to the other. I can't say for sure how much it weighs, but that is a nice fish! Congrats!